I wanted to share with you a manicure I wore before Christmas, OPI Sparkle-icious. This is an amazing glitter, it looks like Mardi Gras on your nails! 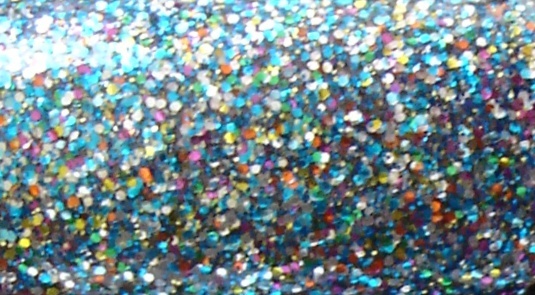 One of the super chunky glitters from the Burlesque collection, this is full of equal parts blue, magenta and gold glitter. It is bling-tastic, haha. This was four coats - I think it was fairly decent in three, but it seems like lately I have always been erring on the side of one extra coat.... so four it was! Application was great, for a glitter - just make sure you give it a bit of time to dry in between coats, which honestly isn't that hard since it dries pretty quick. 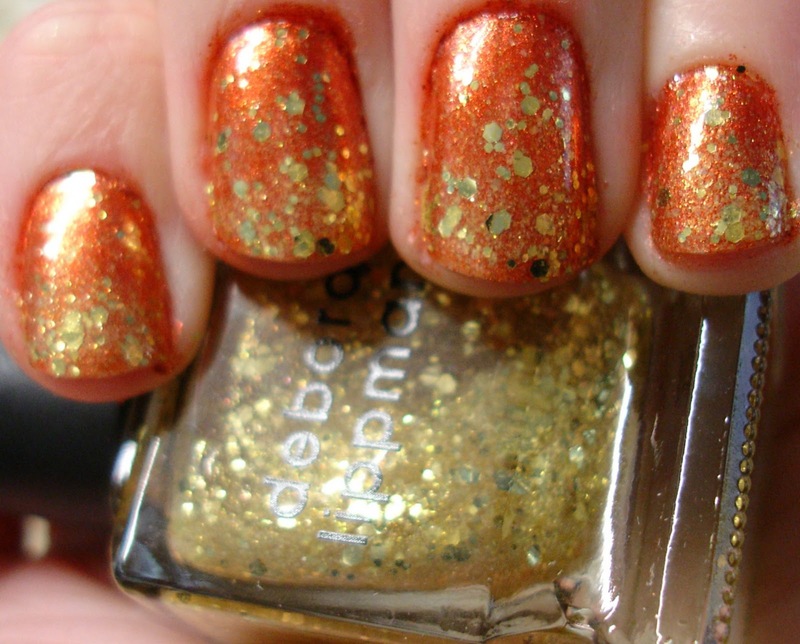 Removal is a pain as always for these chunky glitters, so be prepared to bust out some foil! While it was hard to capture a picture of just how sparkly this one is, the picture above does it a little bit of justice. Definitely a keeper. I love this collection! This is one coat of Zoya Trixie followed by four coats of China Glaze Party Hearty. I thought the from other blogs I had seen this glitter was a bit more opaque than this, achieving a similar look after only two coats. And I wasn't doing super thin coats either...? Oh well, adding a couple of extra coats was a minor inconvienince. 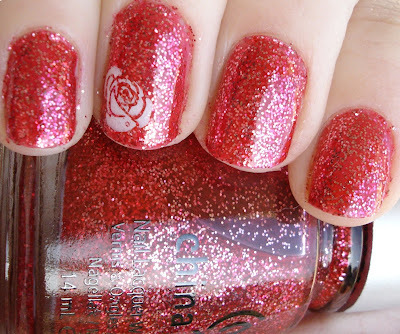 This is the perfect Christmas glitter - I love it! It was great for the party I went to last night. 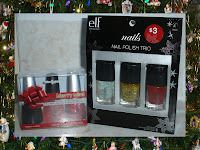 One of the suggestions I got from the giveaway was to do a holiday french manicure, using bright colors. I thought this sounded like a really fun idea! For these nails, I started off with one thin coat of OPI Glitzerland, just to give a nice touchof that sparkly champagne color to the nail. After letting that dry, I applied tip liner stickers and used alternating red (OPI Affair in Red Square) and green (China Glaze Paper Chasing) to apply the tip colors. I used two coats of each of these to get full coverage. Finally, to give it a final Christmas look, I added holly bundles from bundle monster plate BM14. I topped it all off with a coat of Seche Vite! I have sent you both e-mails as of just a minute ago, please get back to me ASAP with your addresses so I can get these beauties out to you soon! Thank you all so much for entering! 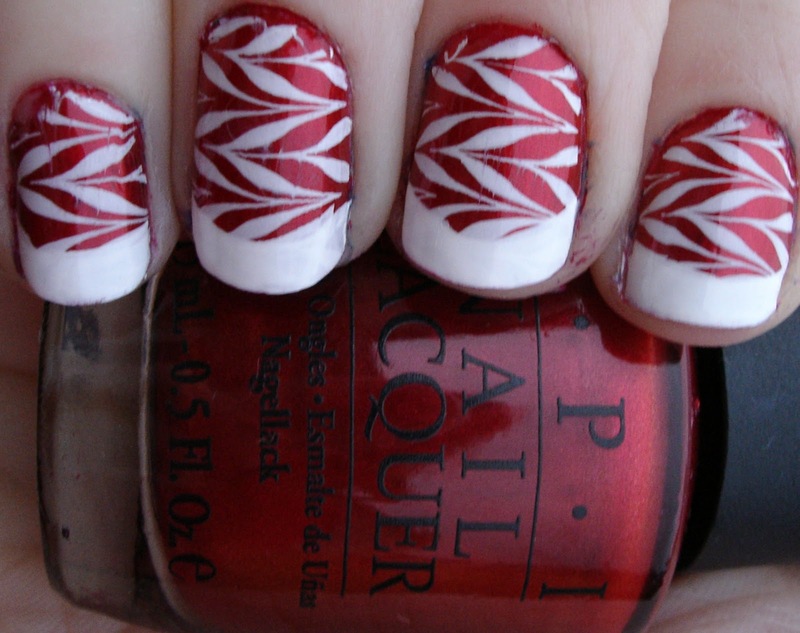 I loved all of the suggestions I got for holiday manis, although I might have to chicken out on free-hand nail art until a later date... sorry. :( BUT I have gotten some great ideas for nails that I have done recently and that I plan on doing this week! Polishology is also very close to 300 followers - once we reach that, I plan on having a much larger giveaway to thank all of you! I will start collecting up goodies for it now... tell your friends to join! As you may know from previous posts or Twitter, I have been really sick this week. I woke up Saturday morning feeling pretty much fine, and by Saturday afternoon felt terrible. I am still sick too, although I think I am finally starting to feel just a smidge better. 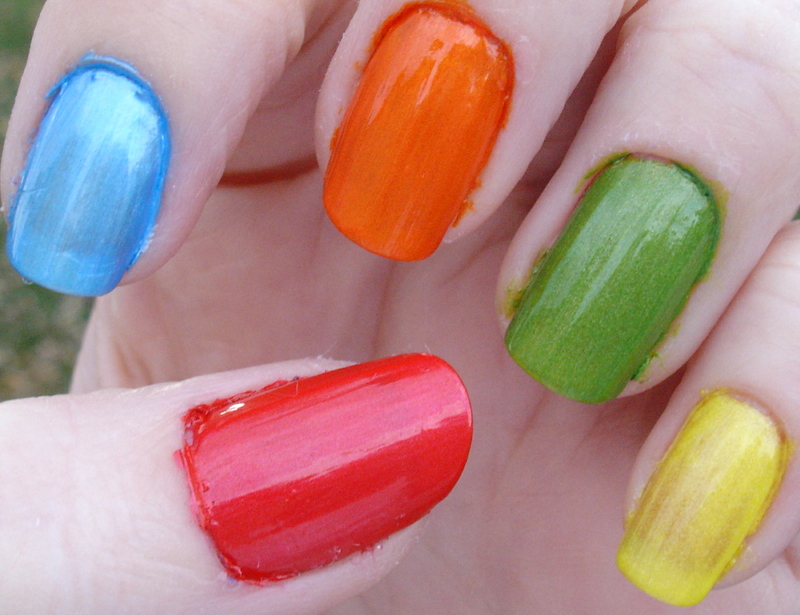 Anyway, I needed to paint my nails on Sunday (they were bare, and I didn't want to chew them!) and wanted something really easy; no Konad, not too many coats.... and I sure did pick the right polish! 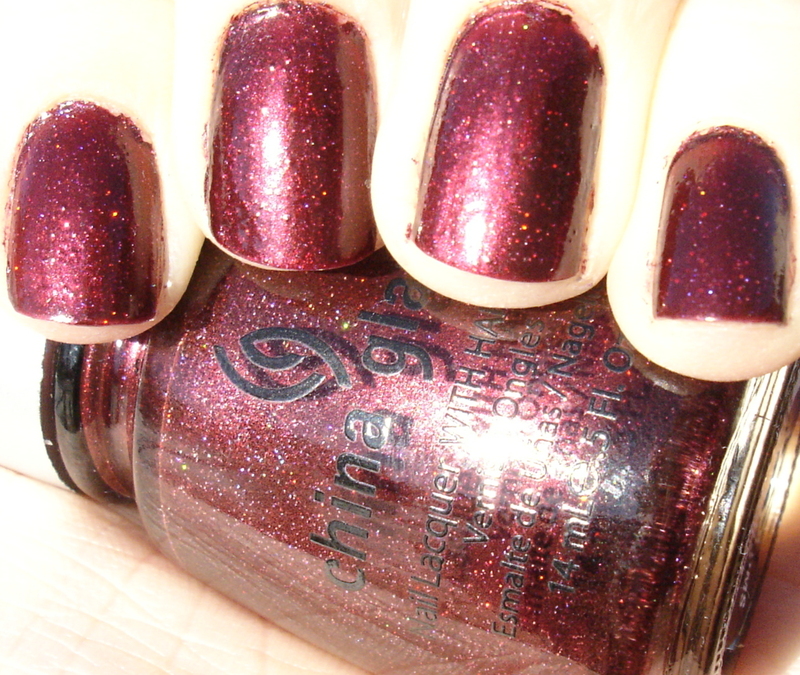 This is one coat of China Glaze Sugar Plums. One Coat. Needless to say, this ended up being the perfect choice for me that day - while I have read most people used two coats of this, one was plenty for me! 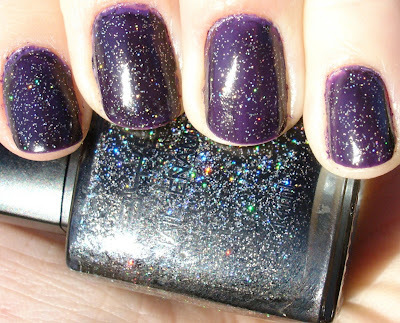 Sugar Plums is a really gorgeous deep plum color with really nice holographic glitter. Application was obviously great, although the surface was left a tad bumpy. The formula reminded me of CG's Good Witch? or The Ten Man. A coat of Seche Vite took care of most of that bumpiness though! 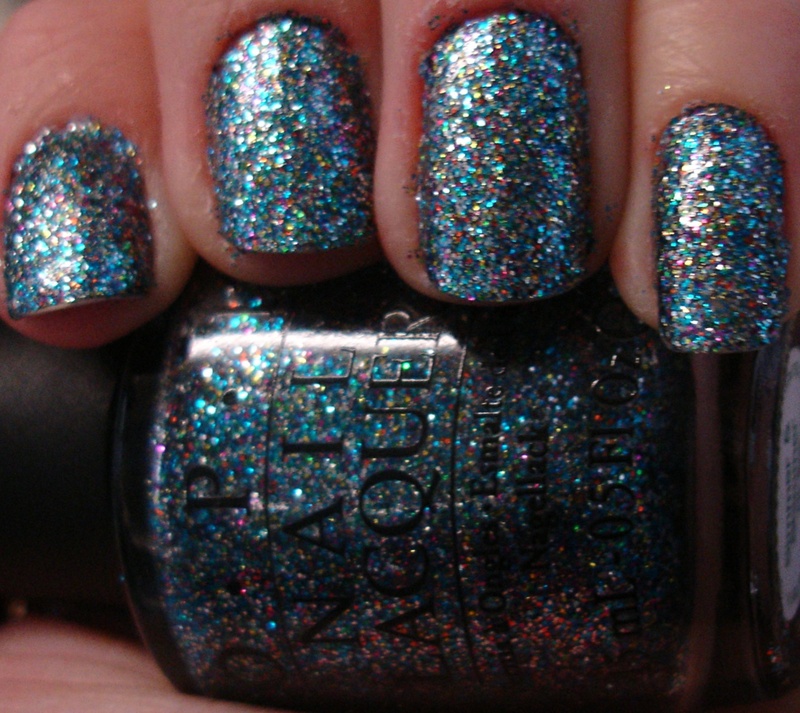 As I often find with glitters like this, it was hard to capture the true sparlke of the polish. 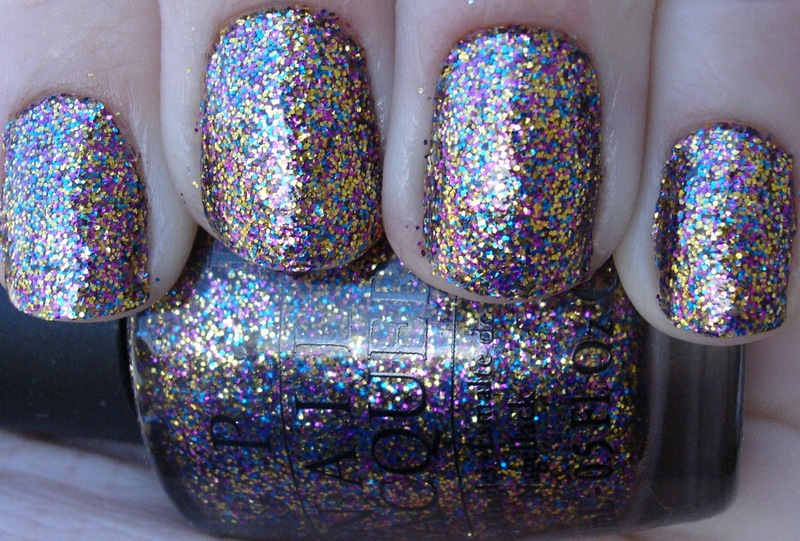 This one was VERY sparkly, and the holo was really pretty. If you click on the picture above, you can see more of the holo gliter. 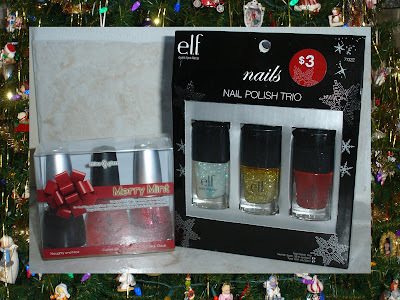 Also, do not forget that TODAY is the last day to ENTER MY GIVEAWAY!! Today I wanted to share with you all a gorgeous blue polish from Zoya! For these nails, I started out with four coats of the beautiful Zoya Kotori, a polish from the Fall 2007 Downtown collection. Kotori has a sheer dark gray base, and is totally jam-packed with bright blue shimmer. The shimmer, which also has a flash of turqouise to it, gives this polish a lot of depth in the sheer base. While I used four coats, three would have sufficed to achieve bottle color. Application was fantastic, as is the case for pretty much every Zoya I have used to date, and the dry time was fine as well, making the multiple coat application not such a big deal. Sometime about this polish made me think of the night sky, so I decided to stamp it with stars! 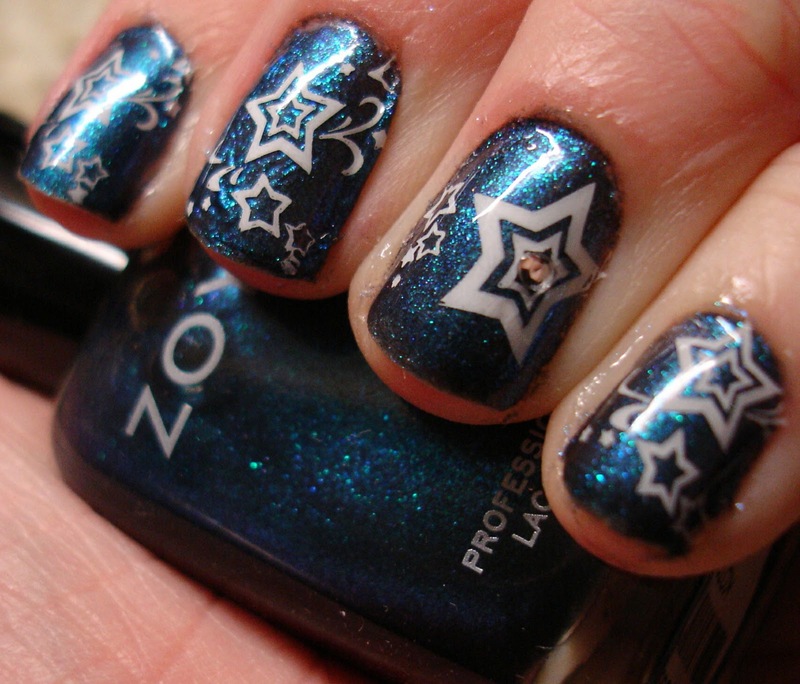 I used BM21 and BM05 (ring finger) with Konad Special White to add the stars. Since I was in a Christmasy mood, I placed a larger star on the ring finger to symbolize the Christmas star. 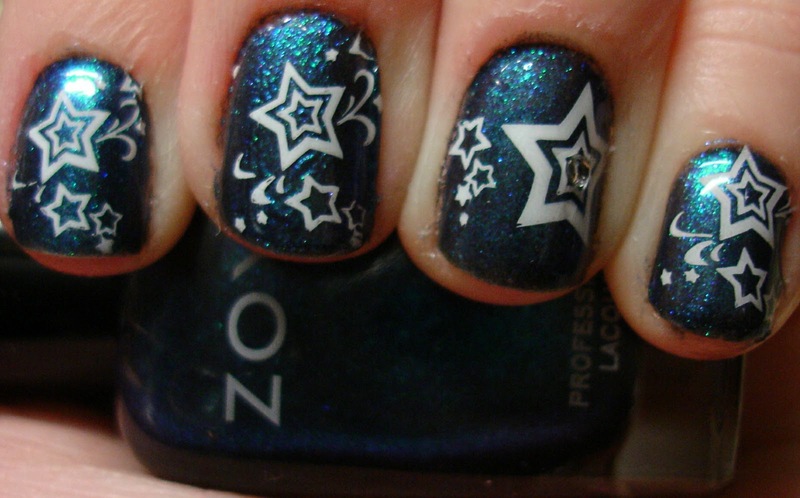 Then I added a gemstone to the center of the larger star, and topped it off with some Seche Vite! 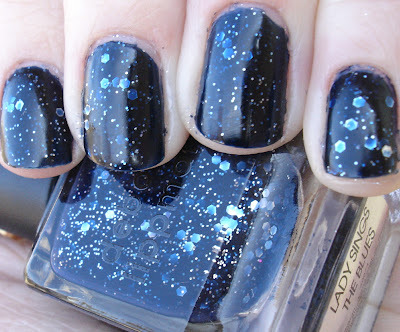 This was a fun manicure, and Zoya Kotori is definitely going on my list of favorite blues, with its stunning depth. I have seem some really neat layering done with this one as well, so I may have to try that out soon myself! DISCLOSURE: The polish featured in this post was provided to Polishology by Zoya for review purposes. This is an honest and independent review and was in no way influenced by the company. Hey everyone! I just got this news from Nicole by OPI - they are releasing a new Walmart exclusive line, with some really gorgeous shades! This January, Nicole by OPI turns up the heat with four fashion-forward additions to the Nicole ♥ Walmart collection, available exclusively at Walmart. From reds in hues of burgundy and mauve to purples in shades of plum and iridescent lilac, these four new Nicole by OPI Nail Lacquers provide a modern take on classic favorites. This glimmering lavender will never let you down. Mauve has never looked this chic! This classic red is one of the good guys. Hold onto gorgeous color with this persistent plum. Nicole by OPI Nail Lacquers and Nail Treatments contain no DBP, Toluene, or Formaldehyde. These new Nicole ♥ Walmart Nail Lacquers will be available January 2011 at select Walmart stores nationwide. The two we have pictures of so far look really gorgeous, I can't wait to see the rest! I am sorry for a lack of posting the last couple of days, I have been (and still am) really sick.. :( But I will plan to get a post up with some pretty nails later today for you to look at! 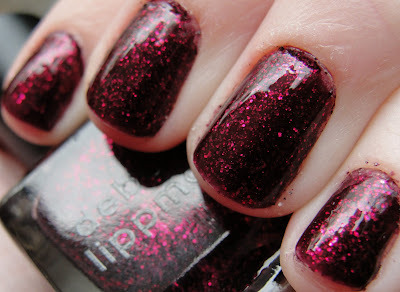 Today I want to share with you another gorgeous Lippmann polish! This is another polish from the All That Jazz trio. Deborah Lippmann Lady Sings The Blues is a dark navy base packed with silver chunky hex and microglitter. I absolutely love the way this one looks! This was two coats, which was plenty for decent coverage. 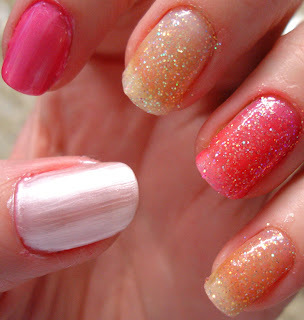 Dry time is very nice as well - just be sure to give it enough time that you don't accidentally push the chunky glitter around on the nail! Each coat gives you a nice distribution of both types of glitter. I wanted to share with you all a couple of cool promos from Zoya, one of my new favorite nail polish brands. I am sure most of you have seen these already but just in case you haven't, check out these awesome announcements! 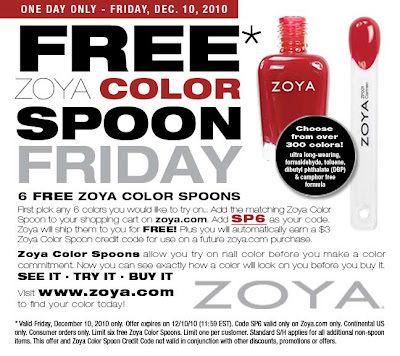 FREE Zoya Color Spoon Friday! First pick any 6 colors you would like to try on... Add the matching Zoya Color Spoon to your shopping cart on zoya.com. Add SP6 as your code. Process order. Zoya will ship them to you for FREE! 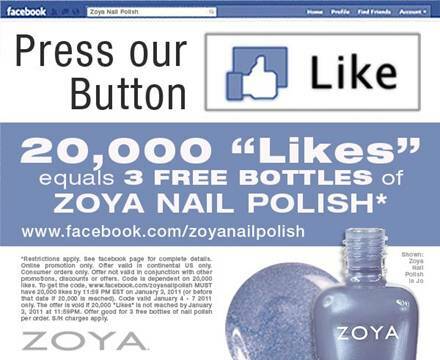 Plus you will automatically earn a $3 Zoya Color Spoon credit code for use on a future zoya.com purchase. 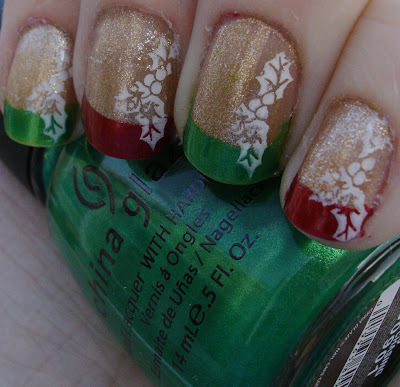 Feel free to order more at the regular price if you would like (shipping is always free on Zoya Color Spoons). 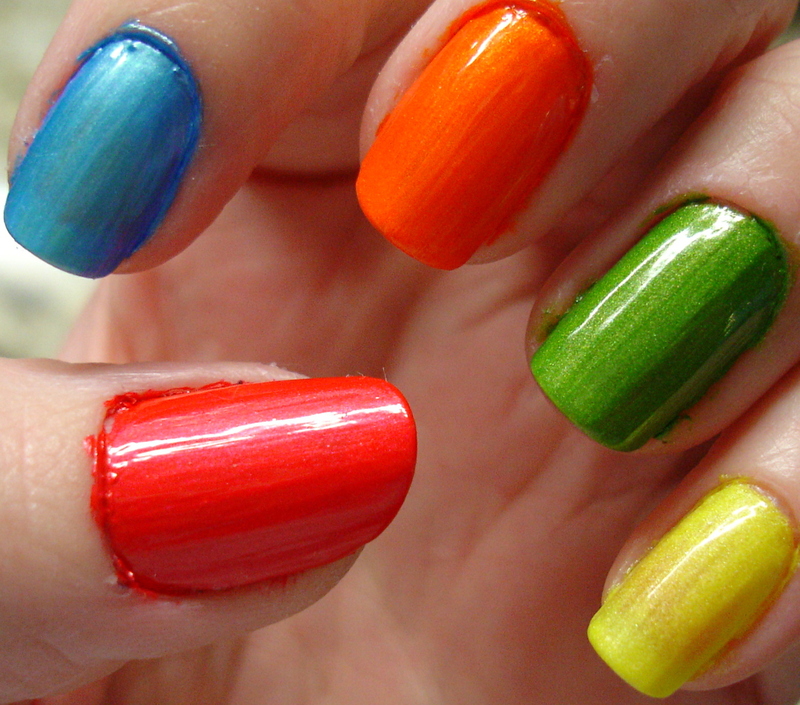 Zoya Color Spoons allow you try on nail color before you make a color commitment. Now you can see exactly how a color will look on you before you buy it. To learn more about Zoya Color Spoons and how easy they make it to find the perfect nail polish color see the video here. Color spoons are an awesome way to check out these polishes before you buy them, to see what the polish really looks like and how it works with your skin tone. Plus, you get a $3 credit towards buying one (or more) of the colors you try! There is no way to go wrong here - go start picking out your colors for tomorrow! 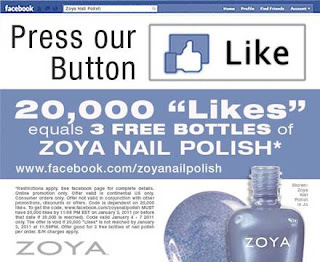 Okay this one is pretty self explanatory and also awesome - go "Like" the Zoya page on Facebook, and if they reach 20,000 by January 3rd, 2011, all of their fans get a code for three free nail polishes. Sounds like an amazing way to pick up some of the colors you try out from your free color spoons.... they are SO close (19,423 as I write this), so if you haven't already go LIKE ZOYA NAIL POLISH! 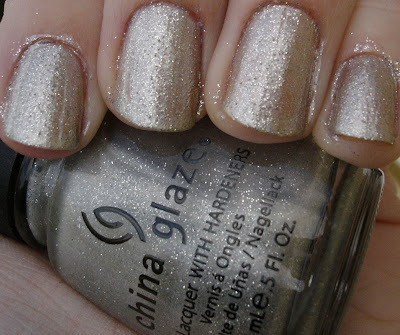 Today I wanted to share with you a really gorgeous silver glitter polish, China Glaze The Ten Man from the Wizard of Ooh Ahz collection. The Ten Man is a frosty light silver polish loaded with silver microglitter. It has a very similar finish to GOOD WITCH?, another polish from the same collection that I reviewed earlier (on much longer nails!). Here I used three thin coats for full coverage. It is a bit on the sheer side, but these three thin coats really applied nicely and dried quickly for an overall very positive application! The only downside is that the finish on this one is a bit bumpy without a topcoat (which I am not wearing in this particular photo), but one coat of a nice topcoat should smooth it out very nicely! This is one really sparkles quite a lot in the sun. It is a really great silver! DISCLOSURE: The polish featured in this post was provided to Polishology by China Glaze for review purposes. This is an honest and independent review and was in no way influenced by the company. Rather than use this pretty polish by itself, I decided to start off with another color, since I thought that would give it a really cool and different look. Being the purple lover that I am (go Cats!!) I started with two coats of OPI Funky Donkey. Then I applied a coat of the gorgeous BYS Down The Rabbit Hole. 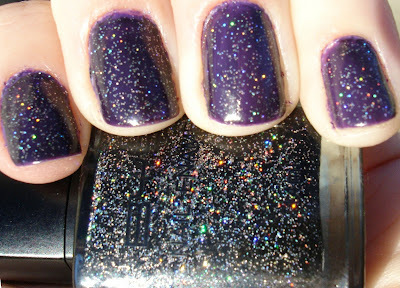 It is a black jelly base with tons of holographic glitter. 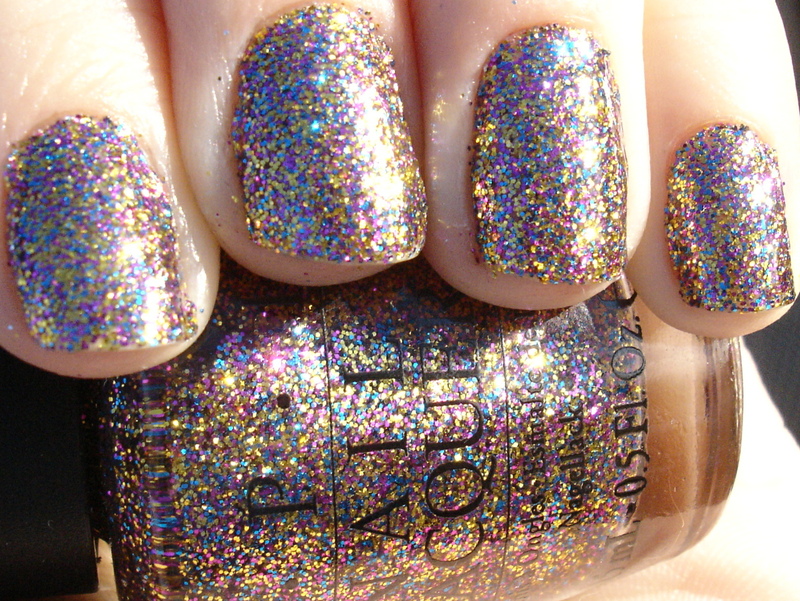 This stuff was seriously shiny - I could not get a picture that captured the true holo glittery bling of this polish, but it was amazing! In these sunlight pictures the purple shows through well, although in other lighting I found that it was an "almost black" polish, with a touch of purple showing through. I think the purple added a lot of interesting depth to this manicure. Slightly blurry shot to try to show more of the holo effect! However I found that I could almost always find some holo peeking through, even in very shady conditions! 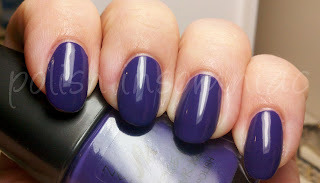 This also wore very well - after topping with two coats of Essie Quick Dry Topcoat, I wore it for three days with virtually no tipwear and no chips. Overall a very nice polish, and a very fun manicure! 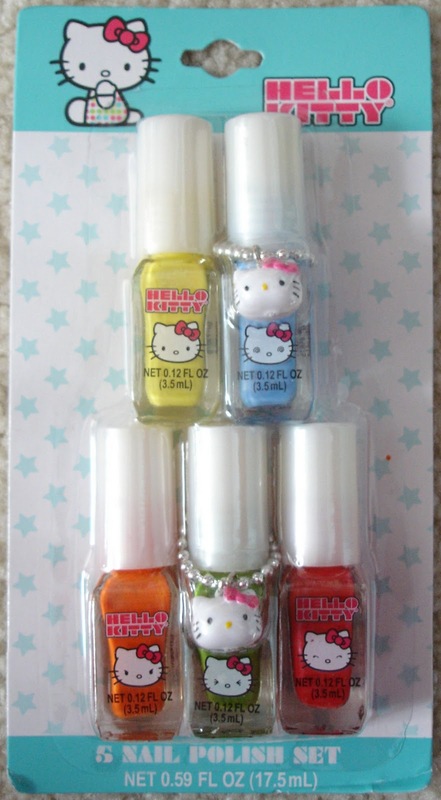 Several weeks ago I was picking up some things at Target and I noticed these adorable little Hello Kitty polishes - the bottles were cute so I decided I had to get them! Even though I had my doubts about the potential quality of the polish, I figured I would go ahead and try them out - I found a few pleasant surprises among the mix! 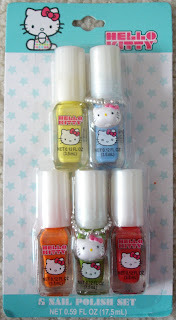 The first set of polishes is a set containing five bright colors, a yellow, blue, orange, green, and dark pink/red. 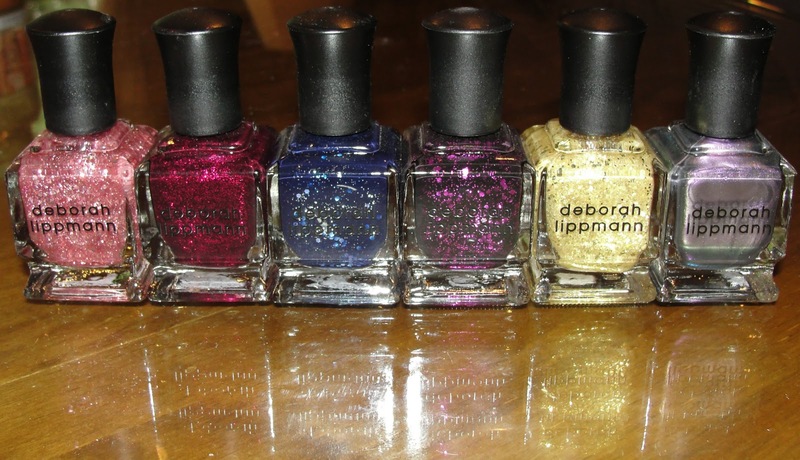 These are all slightly shimmery polishes. All four coats except the red (3), so all are fairly sheer but some are really nice. All without base or top coat. Dark pink/red (thumb) - This one applied nicely in three coats. It was fairly smooth application with decent drying time. The shimmer is a bit more subtle here, but you can see it if you look for it! I liked this one. Blue (index) - This is a frosty light blue with very subtle shimmer. This was a touch streaky and fairly sheer, but still a pretty color. While I might not wear this one on its own due to the VNL, it is a pretty color and may still prove useful. Orange (middle) - This was a pretty decent orange, which fairly smooth application that covered well in the necessary four coats. Green (ring) - This may have been my favorite of this set. A nice grassy green with a lot of shimmer. Good coverage in four coats, could have done three with thicker application. Also went on pretty smooth, I really like this one! Yellow (pinky) - I know that yellows can be hard to apply, but this one was seriously awful. Thin and streaky, and look at what you get after four coats. I have several much nicer yellows, I am not sure this one will be getting any more use from me. Overall: The brights set had a few good polishes - I really like the green a lot, and the red was pretty nice as well. The orange and blue might have some use for me in the future. The yellow - not so much. The second set I picked up contains five polishes in varying pink colors, including a medium and light pink shimmer and three glitter topcoats in peach, ivory and dark pink. Application on all of these is again at 4 coats, without base or top coat. Light pink (thumb) - This was a fairly nice frosty light pink with a touch of shimmer. A bit streaky, as you can see a bit of the brushstrokes in the final product, but fairly nice overall. 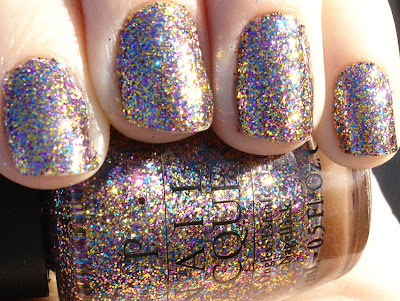 I am not sure I have another polish this light so I may use this at some point. Medium Pink (index) - A nice color with pretty god application. Could have gotten away with three coats, and was much smoother than the light pink. I liked this one. Ivory Glitter (middle) - It says something about how yellow my nails have gotten lately that this hardly looks any lighter than the peach glitter on the pinky). 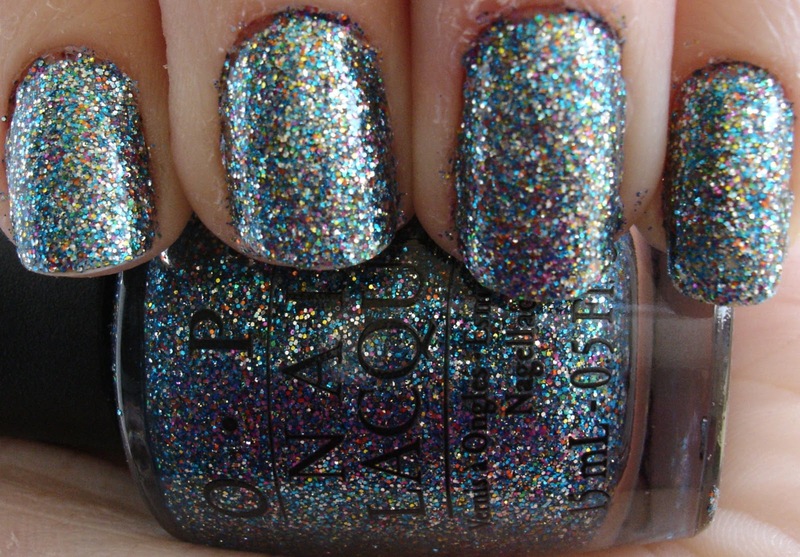 This is a decent chunky glitter topcoat, with multicolored glitter mostly flashing green/blue. As a topcoat, you could of course use many less coats to get a nice look. Dark Pink Glitter (ring) - Like the other glitters, this had decent application. Same type of glitter as in the above polish. This one looked kind of pretty on its own, as well as being useful as a potential topcoat. Peach Glitter (pinky) - Slightly more peach version of the ivory glitter from the middle finger. 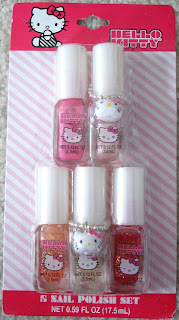 Overall: The pink set contained some nice polishes as well. 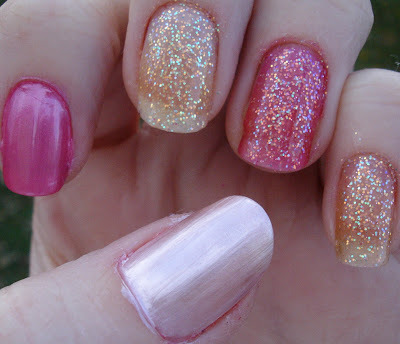 My favorites are the medium pink shimmer and the ivory and pink glitters. The other two may get some use as well. If you were interested in having this polish sent to you and didn't win last time, go check out HER POST and give her your info for another chance to be part of this fun event! Hope everyone is having a great holiday season! I am off to put up our Christmas tree with Dan now! For this giveaway, I am splitting these up into two winners, as many of you requested in a previous post. 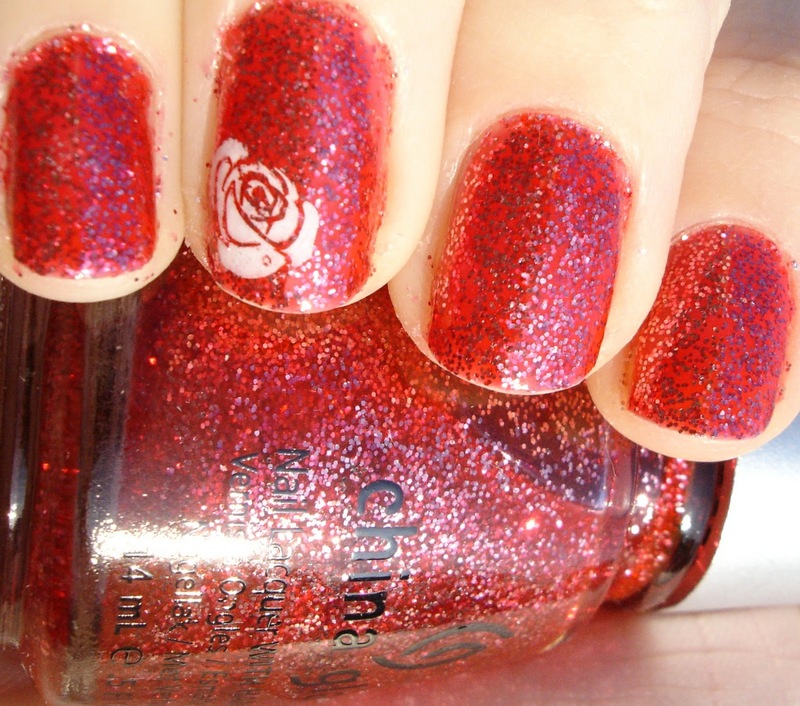 This gives you a slightly higher chance to win some gorgeous polish! Here are the prizes broken down. 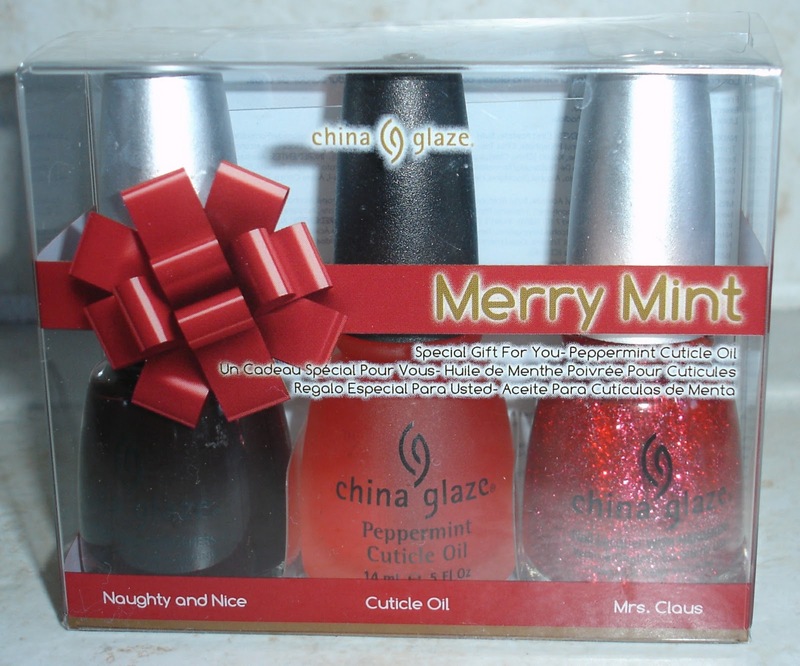 The China Glaze Merry Mint giftset, which includes Naughty and Nice, Mrs. Claus, and Peppermint Cuticle Oil. Elf Holiday Nail Polish Trio, which includes Cranberry, Golden Goddess and Twinkle. This giveaway is open to international as well as domestic followers, and will run until Friday, December17th. I will plan on announcing the winner sometime during that weekend, using Random.org to pick the winner as I have in the past. Fill out this entry form and leave it in the comments section on this post! This gives you a possibility of 10 entries total! I may also add one entry to those of you who comment regularly on the blog if you enter, but I will do this at my own discretion. ;) Remember to get those entries in by December 17th! Thank you all so much for following, I really appreciate it! I had really meant to get these posted yesterday, but my day was crazy! In a good way, though. :) We started off by visiting my paternal grandparents for a morning brunch, and after visiting with them went to my aunt's for a huge family get-together of my mom's side of the family, with Thanksgiving lunch. Then we drove over to Dan's parent's house for dinner with his family. That is three Thanksgiving dinners. I think perhaps I am still stuffed? It was a really great day though, I love that I got to visit with everyone! For my Thanksgiving nails, I decided to go with a beautiful fall orange and gold. I started off with two coats of OPI Take The Stage, which is a polish I originally had not picked up from Burlesque, but looking at it the other day at Ulta I decided it was a really great fall orange and needed it in my collection - up until this point I only had two oranges, and they were both neon bright, medium-toned oranges. 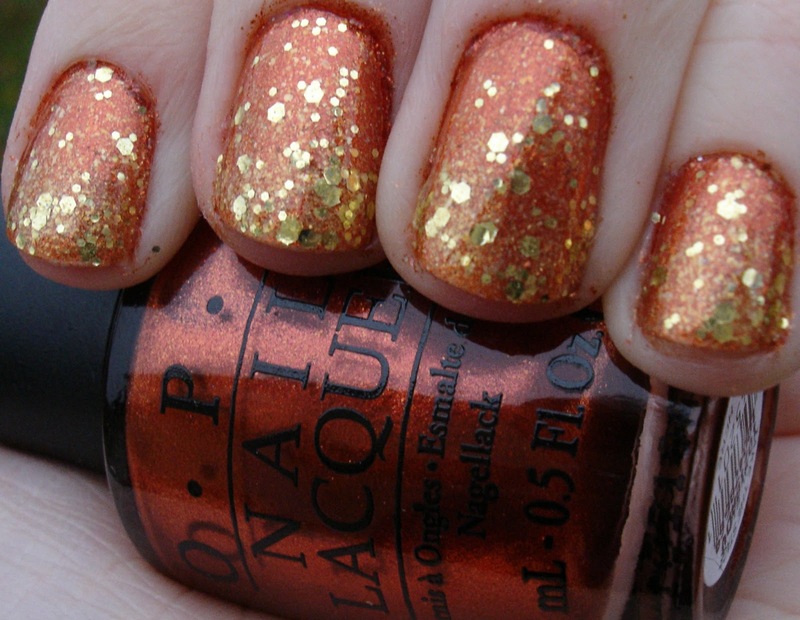 This gorgeous burnt orange with sparkly foil-like finish had great application as well. 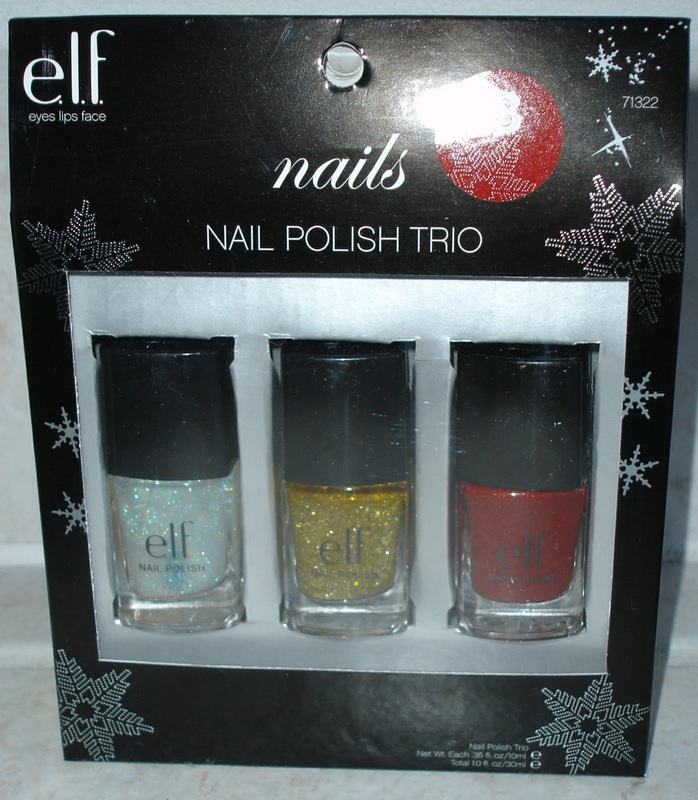 On top of this, I used one of my new Christmas presents, Deborah Lippmann Boom Boom Pow. This is a really gorgeous gold glitter in a super-sheer gold shimmery base, with both large hex and smaller gold glitter. I used a gradient effect on these, with one coat on the whole nail, a second coat on about half, and then a final coat on just the tips. I think it gave these nails a really nice look. I got several compliments from family members, including one from my two-year-old cousin, which was really sweet. There was much internal debate about which to try first, but I finally settled on Razzle Dazzle. Be advised, I do have nubbins in these pictures. :( My pinkie nail broke all the way down, and since I was already patching up another break and had recently lost the length of a thumbnail... I decided they just all needed to be short. But this polish makes even my nubbins looks good! 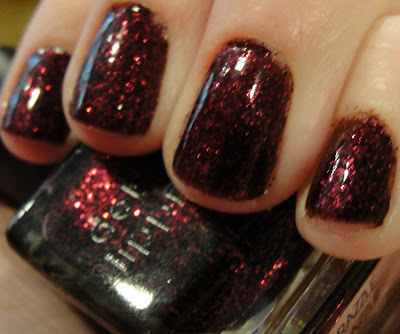 This is three coats of Razzle Dazzle, which is a gorgeous dark berry jelly packed with glitter. 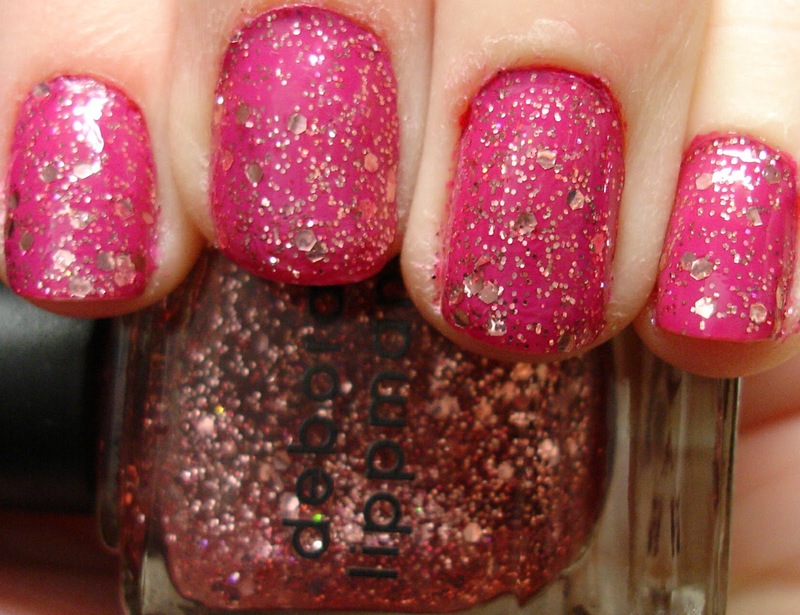 It is really a stunning polish, and I have gotten many compliments on it during the last few days! Formula, application, and dry time were all great. I probably could have done two coats if I had used slightly thicker coats, but mine were rather thin. You see the nails in there, right? 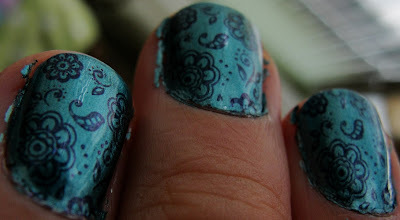 Haha, okay so this is not really so much a picture of my nails, but tell me that is not like, the cutest baby ever. She is three months old now, and starting to really develop her personality rather than just be the cute newborn that she was last time I saw her. I can't wait to see her in a month for Christmas! 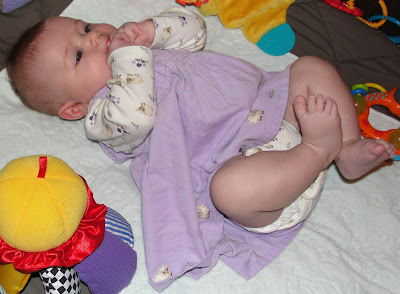 Just because you can never have too many cute baby pictures. ;) I also did Christy's nails while I was down there, which I will be posting soon... along with my Thanksgiving manicure (using another Lippmann!) tomorrow and a Holiday Giveaway coming up this weekend! Sorry for a bit of a delay in posting the last couple of days, I am visiting my sister, brother-in-law, and my adorable niece Evie this weekend! It has been a lot of fun - Christy and I did some nail shopping and painting, which I am sure you can expect to hear all about in the coming days! Today I will share with you another amazing polish from the OPI Burlesque collection, Simmer and Shimmer! Simmer and Shimmer is a really gorgeous, mostly blue glitter polish, although it has quite a bit of other colors packed in there! This is three coats, which was needed to achieve full opacity. The dry time was very decent on this one, and although the finish was a bit on the bumpy side, a couple of coats of a good topcoat will smooth this one. 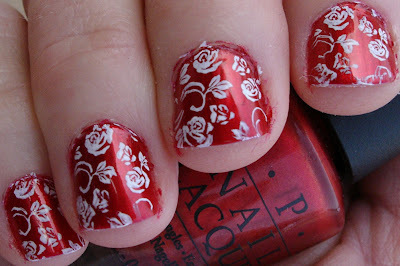 I used the Essie Good to Go again on this one, and without Konad to smudge I really loved the topcoat! This one did have a couple of small ships after two days of wear, but I have found that to be the case with several of these glitter-bomb types of polish. 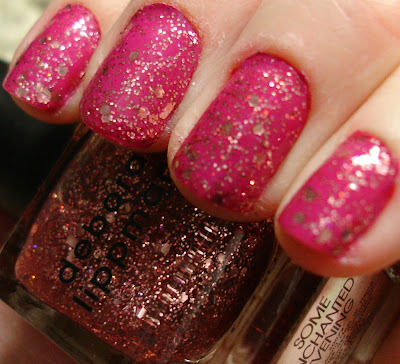 This one was so gorgeous I wore it alone rather than continue my Konad-over-chunky-glitter experiment. Check out all of the colors that are in this beauty!